Theme: Through a clear understandings of both the Christian gospel and the ways children grow spiritually, parents may become more effective in sharing the way of salvation with their children and in acquainting them with the Savior. Setting: This material is designed for several sessions with parents of children from birth through pre-adolescence. Each session includes text that can be used in developing the seminar and suggested exercises for participants. Presentation Helps and Handouts are found at the end of the material. Though the material is targeted toward parents of preschool and elementary children, parents of teenagers may benefit from such understanding as well. To share the Good News of the gospel with parents. To help parents to experience the joy and peace of the gospel anew. To describe the process of spiritual development in children. To enable parents to convey the Good News of the gospel winsomely, so as to increase the likelihood that their children will accept Christ and make Christian values their own. Seminar Illumination: Throughout the following material, numbers in parentheses (1), (2), (3) will indicate illustrations, quotations and other material found in the section called Seminar Illumination which may be helpful in your seminar development and delivery. Illustrations from your personal experience as a parent will bring added interest to the material. Have you experienced the emotional roller coaster of parenting? Feeling great about yourself sometimes, confident about your parenting, proud of the way your kids are turning out. Feeling so inadequate, frightened, and discouraged at other times you almost wish you had never decided to become a parent? Are you here, just eager to learn all you can about the spiritual nurture of your child? Or have you already faced complications you couldn’t have anticipated, problems beyond your own making? Relax! Enjoy! Take heart! God has declared Himself to be in this business of parenting with us. The thought that impresses me right now is . . . I find so much joy in the Good News that . . . It seems almost too good to be true that . . . I find it difficult to believe . . . It brings me great peace to know . . . The words that are the most precious to me are . . . I wish I understood better . . .
It’s easier for me to believe that . . . is true for others than for myself . . .
1. Parents cannot give their children what they do not have. The Good News must first be in our hearts before we can spiritually nurture our children. To provide for our children’s deepest needs. To convey the core values of Christianity. To release our children as they take up adult responsibilities. 3. Children need parents to be what counselors call a “non-anxious presence” in their lives. With all the turbulence of growing up, children need parents who can see the big picture, who can give them time and space to grow spiritually, as well as in every other dimension of their lives. Parents can offer this time and space more readily when they themselves have found peace and rest in the Good News. After [parents] have done the best they can do for the good of their children, they may bring them to Jesus. . . . As the mother’s heart yearns for the help she knows she cannot give, the grace she cannot bestow, and she casts herself and children into the merciful arms of Christ, He will receive and bless them [both]; . . . These precious words are to be cherished, not only by every mother, but by every father as well. These words are an encouragement to parents to press their children into His notice, to ask in the name of Christ . . . (The Adventist Home , pp. 274-276). Go in peace, with GOOD NEWS in your hearts! It is the best foundation that can be laid for the spiritual nurture of your children! Robert Fulghum in his book Uh-Oh (1991) tells the story from his childhood of being taken to Sunday School at about the age of four. One of the first things he learned was the Lord’s Prayer. But when Robert listened to the teacher recite, “Our Father, which art in heaven, Hallowed be Thy name,” he heard, “Our Father, . . . Howard be Thy name.” (The word “hallowed” and “Howard” sound somewhat similar in English.) Now Robert’s grandfather’s name on his mother’s side was Howard. So grandfathers and God got all mixed up in his mind as one and the same. Since he and his grandfather loved each other dearly, and since nobody picked up on his misunderstanding for a long time, Robert grew up with a very warm, comfortable notion about God and feeling pretty well connected in God’s family! Every Christian parent hopes his or her child will grow up with warm notions about God and feeling good about being part of His family the church. Increasing the likelihood that early feelings of love for Jesus will blossom into a full-fledged love affair with God and His family is what the spiritual nurture of children is all about. The spiritual nurture of children must be addressed in the context of the larger process of Christian parenting. Children can’t be neatly divided into component parts, allowing for parents to separate out and attend particularly to their spirituality. Child growth and development is wholistic. It is physical, emotional, intellectual, social and spiritual, and the development of each dimension affects all the others. The process of Christian parenting fosters healthy development in every aspect. Parents are to provide for a broad spectrum of needs universally experienced by children-needs which are physical, emotional, intellectual, spiritual and social (1 Tim. 5:4,8; Eph. 6:4). Parents are to teach their children what they need to know about living in the world-how to take care of themselves and enjoy positive relationships with God and other people (Deut. 6:6-9; Prov. 22:6; Eph. 6:4). Parents are also tasked with the responsibility to correct their children. This challenging responsibility is given to parents because most fathers and mothers love their children, and love is the foundation of all discipline (Prov. 3:11, 12). Parents are also in the best position to provide the necessary mix of warmth, love and communication-along with appropriate limit-as a child grows (Prov. 13:24; 29:15; Matt. 7:9-11). Ellen White sums it up in one sentence: “Their whole religious experience is affected by their bringing up in childhood” ( Child Guidance , p. 473). A father tells the story of overhearing his son and a group of small boys each trying to outdo the other in a discussion about their fathers. The father who eavesdropped on this conversation was at first overwhelmed with the responsibility of being the person who in His child’s eyes “knew God.” And that is an awesome responsibility! But there is Good News! It is knowing God as He has made Himself known in Jesus Christ that can lift the heavy load of responsibility from parenthood. A growing understanding and acceptance of all that has been accomplished for us in Christ can quiet our own inner anxiety by calling a halt on our futile attempts to save ourselves and our children. As we leave the saving to the Savior and place ourselves and our children in God’s hands, an abiding peace awaits us. God longs to lift from our shoulders the self-imposed weight of raising perfect children who do not need a Savior. He wants to open our eyes to His finished work in Christ and to His patient, persistent and winsome ways of drawing each one to Himself. Nothing can ever place anyone outside the circle of His love. Increasing probabilities. Proverbs are about probabilities rather than promises. They reflect what is likely to occur; they do not guarantee perfectly predictable results. Raising children is not an exact science. There are no guarantees. In this verse the wise man is helping us to understand how parents and others involved in the spiritual nurture of children can increase the likelihood that children will make the spiritual values they have been taught in childhood their own as adults. A child’s uniqueness. The proverb places emphasis on the fact that successful parents will seek to understand the way he or she- their unique child -should go. While we need to understand the broad similarities of children at each stage of development, we must also give special attention to the unique characteristics and needs of each individual child. The dual meaning of the verb “train.” The Hebrew verb “train” or “train up” had two common usages. It was used to describe the process of subduing a wild horse. Parents of strong-willed children can readily understand the comparison between parenting and taming a wild horse! There was also another intriguing usage. The verb was used to describe a common practice for stimulating the sucking response of a newborn baby. A midwife would stew dates or figs to produce a sweet syrup, coat her finger with the tasty substance, and massage the baby’s lips, gums, tongue and palate until she lured him into sucking her finger. Once the sucking response was firmly established, she would put the baby to the mother’s breast (Swindoll, 1980). The spiritual nurture of children is also about making God and Christianity so attractive, so winsome, so delicious, that our children will find them irresistible. Serving up religion on a tasty smorgasbord, as Roger Dudley recommends in his book Passing on the Torch (1986), has much to do with understanding the process of spiritual development and knowing how to facilitate a child’s appropriate and timely passage through the stages. The Bible views human beings as growing and developing in every dimension of their lives from birth to death. Jesus’ wholistic development-physically, mentally, socially and spiritually-was intentionally marked by the gospel writer Luke (2:52). There is much research to support the fact that growth in human beings generally proceeds in a predictable fashion according to an internal script imprinted by the Creator. As Ellen White explained, “All parts of the human organism . . . were placed under law” (The Ministry of Healing, p. 415). A number of Bible passages speak specifically about spiritual growth. There is a time, Paul says, for thinking and behaving like a child (cf. 1 Cor. 3:1, 2; 13:11a). But there is also a time for becoming an adult, for growing into mature faith (cf. Eph. 4:13; 1 Cor. 13:11b; 14:20; 2 Pet. 3:18). Christian parents who understand the natural processes of child growth and development will be better able to capitalize on opportunities for spiritual nurture. They will be more adept at anticipating “teachable moments” and matching learning experiences with the child’s level of maturation. They will also be better able to detect when a child is ready for the next learning step. As Ellen White wisely noted, “He who seeks to transform humanity must himself understand humanity” (Education , p. 78). Various theories on how children develop spiritually have been put forward. They are helpful toward understanding the process of spiritual growth. They are also helpful in determining how and when the content of faith-the teachings and values of the Bible-can best be introduced and expanded. The various spiritual development theorists typically emphasize hereditary and/or environmental influences which they believe to be the primary factors determining children’s behavior. Scripture also acknowledges the impact of both heredity and the environment on behavior. The Psalmist affirms his belief that all his days were written in God’s book before he was even born (Ps. 139:15, 16). On the other hand, Manoah and his wife acknowledge the importance of the environment as they plead with God to help them parent the child Samson wisely (Judges 13:8). Paul marks the sincere faith modeled for Timothy by his grandmother Lois and his mother Eunice as the seed bed for Timothy’s strong faith (2 Tim. 1:5). Though heredity and the environment are powerful factors, the Bible also clearly identifies human beings as free moral agents, created by God with the capacity and the God-given right to choose their destiny (Josh. 24:15; 1 Kings 18:21; Rom. 12:2). While the decision about what to do with Christ ultimately rests with each individual, the intentional spiritual nurture of children in the family and in the church vastly increases the likelihood for a personal choice for Christ and the values of His kingdom. Piaget described three cognitive stages between birth and twelve. His fourth stage characterized adolescents and adults. A brief look at these stages and their implications for the spiritual nurture of children will summarize the approach of the theorists who see spiritual development as closely paralleling the cognitive development of a child. Stage 1: Sensorimotor (0-2 years). The child at this stage is mostly occupied with learning to coordinate different parts of his or her body and exploring the world through the senses by seeing, smelling, touching, hearing and tasting it. Children at this age need an enriched environment with freedom to explore it within the bounds of safety. (3) David Elkind (1981) cautions, however, that while children need an interesting and stimulating environment, too much stimulation can be detrimental. Stimulation becomes harmful when it interferes with unhurried attention to basic needs, such as the need to sleep, to be held close, to enjoy a parent’s undivided attention, to be touched lovingly at bath or feeding time, to experience soothing comfort when distressed, to grasp and drop an object dozens of times with someone there to pick it up, etc. Growth cannot be rushed. Implications for spiritual nurture. A child at this stage has no sense of conscience. He does not make moral decisions. He does what he is taught and encouraged to do by his parents. The child’s grasp on spiritual lessons will be negligible at this age, but strong impressions are created which form the foundation for a child’s feelings about family, God, and church. The parents’ role is crucial as they largely determine the quality of a child’s human relationships, as well as the child’s intellectual stimulation and exposure to the world. Egocentricity. The child at this age assumes everyone else is experiencing the world the same way he or she is at the moment. If she feels rested and happy, she thinks everyone does. It is difficult for him to understand any other point of view from his own. An important task of this stage is “decentering,” gradually moving from this egocentric perspective to being able to distinguish themselves from others and understand that there is more than one perspective, more than one way to experience the world. Implications for spiritual nurture. Children in this stage imagine God in human terms. They picture Him with physical characteristics similar to their own. Prayer is vaguely understood and consists primarily of requests. However, the establishment of prayer rituals is important. Lifelong habits of prayer at meals, in the morning and at bedtime are often rooted in this period, though throughout life they take on much deeper meaning. Conscience begins to emerge during this stage. Right and wrong are first understood as absolutes-black or white-with no shades of gray. Children at this stage also believe that if you disobey, imminent justice can be expected. Something bad will happen to you. On the other hand, if you are good, God will take care of you. Listen and give truthful answers. It is important to listen to children and provide simple, truthful answers to their questions. Think through how you can explain spiritual lessons at the child’s level without telling them something you will later have to undo. (6) If religious things are taught in ways which do not fully reflect truth, even though you are just trying to keep them simple, there is a danger that the child will later believe he was deceived when he was young. He may even come to the conclusion that religion itself is a lie. Recognize their behavior as often motivated by a desire to please. Preoperational children want to please. They also want to avoid disapproval and unpleasant consequences. During this stage children can learn about Jesus’ love and will respond with love in return. They want to please Jesus. This is a critical stage in which attitudes toward God, the Scripture and the church are established. It is especially important that they do not get the message that Jesus’ love is conditional upon obedience. Jesus loves unconditionally. We obey because we love Him so much. Stage 3: Concrete operations (7-11 years). Children are now able to manipulate information in their minds. They can understand that, though poured into several different shapes of containers, a cup of water retains the same volume. They can define, compare and contrast. However, their understanding is still in concrete terms. They do not understand symbolism and figurative language. They can think about what they can see. They can reason on the basis of past experience and understand cause and effect. They still grasp lessons better when you begin with the specific and progress to a more general application. Developing conscience. Sin is understood in the narrow sense of specific wrong acts, rather than as rebellion against God or a severed relationship with Him. Consequences related to actions. Because they now understand cause and effect relationships, children at this age are beginning to understand how consequences are related to actions and to expect correction to be related to misbehavior. Love of collections. These children love to collect things-a bird list, coins, stamps, bottle caps, shells, evangelistic sermons, etc.-and their collections represent their increased mental ability to sort and classify. This is a natural time period for teaching children the books of the Bible, how they can be classified as books of law, writings, prophets, letters, etc., and how to locate the texts in the Scriptures. Increased memorization ability also makes it an ideal time for building a child’s repertoire of Scripture verses committed to memory. It is important, however, that we work to help them understand the verses, not merely to memorize them in a rote fashion. Friendships. Because they have a growing number of friends, concrete operational children have a growing sense that God is their Friend. They think of Him primarily in terms of His actions-He takes care of us, He died for us, He is coming back for us, etc. They continue to make requests of God in their prayers, but will begin to be able to talk to Him as they would to a parent or a friend. They are no longer restricted by a limited understanding of time, space, and numbers. They can reconsider thinking they have done previously when new information is available. They are ready to move from mere knowledge to an understanding of facts or ideas. They can develop skills to apply what they have learned in a variety of situations. They can learn to break things down into component parts as well as to construct a meaningful whole out of related information. They are capable of judging the value of a plan of action or an idea. Implications for spiritual nurture. Children are now able to enter into a personal relationship with God and to more fully understand His mercy and grace, His power, His sovereignty, His omnipresence, and His call to live lives worthy of the grace extended to us in Christ. Prayer expands to include more praise, thanksgiving, worship, and intimate conversation. The bigger picture of the great controversy between good and evil can come into perspective. God’s creation ideal for human beings can be discerned. The symbolism and figurative language of Scripture can be infused with meaning. The big issues of life can begin to be addressed: Who am I? Why am I here? Where am I going? Summary. It is important to tailor the spiritual nurture of children to the stage of development where they are. It is equally important to realize that a child’s spiritual growth does not just naturally progress as they increase in age. The capacity for spiritual growth progresses, but intentional spiritual nurture is required for this growth potential to become a reality . Most developmental theorists agree that in order to facilitate growth, spiritual lessons should be presented primarily in keeping with the developmental stage of the child. But opportunities should also be provided to stretch his understanding to the next stage. In the view of those who link spiritual growth with cognitive development, children function mostly within one developmental level, but may operate at times in the stage they have just left behind, and at other times show ability to function at the next level toward which they are advancing. Thus spiritual lessons should be geared primarily to the age-appropriate stage, with some opportunities to stretch the child’s mind toward the next level of understanding. It’s our task to gently enlarge their “boxes” of comprehension, to help them see that things are a bit more complex than they had imagined. This will keep them thinking and growing toward maturity in Christ. While most of the study of spiritual development has focused on the linkages between spiritual development and cognitive development, linkages have also been observed with emotional development. Erik Erikson (Erikson, 1963) proposed eight stages of emotional development based on eight conflicts which confront human beings across their life spans. These conflicts are resolved in the life of each person across a continuum between two opposite extremes. Faith development theorist LeRoy Aden observed a correlation between these eight stages and the process of faith development. He believed that helping children resolve the early stages positively is significant to their spiritual nurture. Aden also believed in the work of the Divine in human lives. Spoiled and pampered. The child views himself as the center of the universe with all of its resources at his immediate beck and call. Mistrusting. The child views the world as a cold, unfriendly place where uncertainty exists as to who can be counted on consistently to meet his needs. Trusting. The child learns he is not the center of the universe; he may have to wait a few minutes to be cared for. However, there are people who love him who will respond to his needs. This child learns to manage his anxiety and be satisfied with the level of comfort he can provide for himself while he waits for a response. Implications for spiritual nurture. Trust is developed when a child’s needs are met in a caring, dependable manner, in an atmosphere of unconditional love. Children need to sense they are loved, regardless of how they behave. Children need a circle of supportive adults, people who give evidence they genuinely like children. The cornerstone for faith in God is laid as the child learns to trust his parents and other caregivers who respond lovingly to his needs. Without the development of trust in childhood, a person will likely struggle for a lifetime to trust other people and to trust God. Stage 2: Early childhood-faith as courage. Erikson described the major conflict of early childhood as autonomy versus shame . If children are allowed to make choices and encouraged to take more and more responsibility as they mature, they will move toward appropriate independence with a healthy sense of self. If, on the other hand, they are made to feel that their attempts at doing things for themselves and taking responsibility are unacceptable, or if they are overprotected, they will likely be plagued with paralyzing shame and self-doubt across their lifetimes. A person needs a healthy sense of self in order to make the personal choice to believe in God, to love Him and to enter into a personal relationship with Him. A healthy sense of self also provides the courage a person needs to confront the emptiness, meaninglessness, anxiety and trials which are part of our lives because of sin. Stage 3: The play age-faith as obedience. Around the ages of 3 – 6, Erikson saw the developmental issue needing to be resolved as initiative versus guilt . During this period, a child’s conscience is developing. If the conscience is insufficiently constructed, the child will be unable to temper his desires and will emerge as a self-centered person with few inner controls. On the other hand, if his conscience is over-developed, if he is made to feel guilty for his initiative, for his desire to be his own person and chart his own course, he will likely emerge as a rigid, moralistic, guilt-ridden, over-responsible person who is exceedingly strict with his own affairs and who seeks to control the lives of others in the same fashion. Parents who help their children toward a balanced resolution to this conflict leave the child’s strong will in place, but also teach him to obey appropriate requests. This balance forms the basis for mature faith. The foundation has been laid for the giving of oneself to God in response to His love and for submission to His will out of reverence for Christ. Implications for spiritual nurture. Ideally, the child will develop at this stage an appropriate balance between self-assertion and self-discipline. The positive development of initiative has to do with encouraging the appropriate assertion of a child’s will. Ellen White spoke of this when she wrote: “Save the strength of the will; in the battle of life it will be needed” ( Education , 288). On the other hand, the development of conscience is also important. Conscience is that inner control which contains a child’s desire for unlimited self-assertion. A child who is developing healthily is increasingly governed by appropriate inner restraints. The development of conscience is crucial to the development of faith. It is as a child learns to make choices on the basis of wider consideration than his own desires that the stage is set for his response to the claims of God upon his life. Obedience can then be truly a response of love rather than rigid adherence to law out of guilt or concern for what others will think. Stage 4: School age-faith as assent. Erikson’s designation of the conflict at this stage is industry versus inferiority. Children at this stage are busy trying to master the skills and competencies valued by those around them. In the process, children develop an image of themselves either as competent or incompetent. Successful resolution of this conflict results in a basic sense of usefulness and productivity, perhaps even a view of oneself as insightful and creative. Failure to resolve this conflict in a positive way results in a crippling sense of inferiority and the perception that one can do nothing well and has little to contribute. Implications for spiritual nurture. Children need continuing reassurance of their intrinsic value as individuals. They also need parents and others who affirm their developing competencies and gifts. In this way parents and others contribute to the formation of the self-image a child will eventually internalize. This self image will profoundly affect the child’s ability to learn and his or her relationships with others. The resolution of this conflict, positively or negatively, profoundly affects spiritual development as well. As part of children’s desire to master those skills and competencies they perceive to be valued by those around them, they become intent upon probing, questioning, and verifying all that they have been taught about God. They do not do this out of disbelief, rather they are working on making what they have been taught their own at a new level. This effort can have the positive effect of moving a child beyond mere acceptance and obedience to parental values, to what Aden calls assent or personal belief. The probing, questioning and verifying initiated at this stage set the foundation for a lifelong quest for truth based on one’s own study and a personal response to God. It is noteworthy that this is the time period in which many young people make a decision for baptism. Parents, pastors and teachers who are in stride with a child’s development do well to capitalize on this opportunity to call him or her to a decision for Christ. Despite all the emphasis on stages of growth and development, it has been observed that children sometimes exhibit moral behavior and a capacity to discern spiritual things which seem far beyond their years. The significant factor, which some theorists believe explains this, is a relational one. Warm, positive, stimulating relationships with parents, teachers and other important adults unquestionably promote spiritual growth. The Russian theorist Vygotsky, for example, believed that the spiritual development of children is impacted by their immediate setting (home, local church and school), by how well these three work together to nurture the child spiritually, by important events which impact the child even though he may not have been directly involved in them, and by society at large. Vygotsky emphasized the importance of mentoring in children’s lives. He likened the teaching responsibility of parents and other significant adults in a child’s life to scaffolding. Scaffolding supports a building under construction. When the building is able to support itself, the scaffold is removed. Likewise, children need adults who support them as they develop by breaking down tasks into understandable and doable units, verbalizing clear instructions, involving them in doing the task together until they develop proficiency, and encouraging and affirming growth. Then, just as a scaffold is removed when it is no longer needed, so the gradual withdrawal of adult involvement promotes growth by allowing the child to take more and more responsibility. John Fowler also sees a relational component to faith development. He believes that all human beings develop faith. What differs between individuals is “what” or “who” we put our faith in. Some people spend their entire lives moving from one thing to another, trying to find something, someone big enough to be worthy of worship and complete devotion. Many settle for someone or something far less than sovereign as their object of worship-perhaps a theory, an organization, or another human being. But the God-shaped vacuum described by the early church father Augustine will continue to draw human beings into a search for the Almighty until they find the One who alone is worthy of worship. What joy can be ours as we link hands with the Almighty as He draws our children to Himself at every step of their development! It our greatest privilege as parents. There is no more important calling. Close each of these sessions with a few “I learned statements” from the group. Take time to respond to questions of clarification. Invite the group to spend time in personal reflection about the stage of development of each of their children and the ideas you have discussed for using age-appropriate means for nurturing each child spiritually. Pray together that God will open your eyes to opportunities to cooperate with Him as He draws your children to Himself. Maintain warm relationships. Think about the person or persons most responsible for your decision to be a Christian. Who influenced you the most as you were carving out your own personal identity? How did they convey spiritual truths to you? Why did you trust them and make similar values your own? Model your faith. Someone has said that children do not learn values, they imitate people. Over time, they decide who they like, and who they don’t like, and after whom they will pattern their lives. They do not make lists of spiritual truths they have decided to accept so much as they identify with people who live those truths. It can be frightening to realize the extent to which our children copy our behavior. To hear your daughter scold her doll in a tone of voice that sounds all too familiar, to see your son control his friend with anger, to see your shortcomings take shape before your eyes in the person of your child, can be overwhelmingly discouraging. Our lives, our family relationships, we must confess, are far from perfect. But there is hope. Modeling as a means of transmitting values is not about flawless human perfection. Our task is not to rear perfect children who have no need of a Savior. Rather, we who have found the perfect Savior are given the privilege of bringing our children to Him. Modeling is about living up to Christian ideals as best we can. But it is also about showing our children what Christians do when they have made mistakes, how followers of Jesus seek and offer forgiveness and find the courage to begin again. Modeling also means demonstrating how Christians handle their disappointments. Modeling means being authentic human beings, and allowing our children to see God at work in our lives when we experience discouragement and doubt. Modeling means letting our children see us turn to Jesus for comfort, peace and reassurance. Modeling is allowing our children to watch Him make new people for His kingdom out of the brokenness sin has brought into our lives. Make their parents’ values their own when they become adults. Demonstrate higher levels of moral development. Become more concerned about the needs and feelings of others as well as their own. Time for fun and laughter. Flexibility when situations and the growth of the child call for negotiation and change. Consistent follow-through on agreed upon consequences when rules are violated. Intentional empowerment of children consistent with their ability, enabling them to assume increasing responsibility for their own decision-making. Willingness to develop skills necessary to resolve conflicts so that everybody feels like a winner. The capacity to work through the process of forgiveness to reconciliation. Establish your family altar. In Valuegenesis: Report 1 – A Study of the Influence of Family, Church and School on the Faith, Values and Commitment of Adventist Youth (1990), researchers studied faith development among 12,000 Adventist youth in North America. They noted that family worship again surfaced as a significant factor in effective spiritual nurture. Family worship provides opportunity for covenant renewal between the family and God, for rehearsal of religious heritage, for values instruction, and for relationship-building between family members. Parents should also watch for opportunities for spontaneous worship experiences with a child-joy at the wonders of nature, excitement about grandma’s visit, delight in the smothering love of a puppy, a sudden awareness that God is the giver of all good gifts. These are some of the most worshipful, teachable moments in the life of a child, though they cannot be programmed or formalized. Involve your family in service. Putting spiritual values into action has also surfaced in research as significant to effective child nurture. Children enjoy helping others. The joy experienced in childhood from serving and sharing may well establish lifelong patterns that will benefit both givers and receivers. Start an “adopt a grandmother/grandfather” program. Make cheery cards for placement on food trays in the hospital and nursing home. Write ADRA (Adventist Development and Relief Agency) for project ideas. Rake leaves, cut grass, etc., for an elderly person. Bake cookies for students away at school. Provide Sabbath School in the home of a shut-in. Give each family member a small amount of money to be used help someone. God intends the family to be a natural setting for carrying out Jesus’ directive, “Go and make disciples” (Matt. 28:19). Jesus identified His disciples as people who “abide in His word,” who live by the principles of His kingdom. Families are central to the disciplemaking process because family is the primary place where values are learned. Jesus also said the community would recognize His disciples by their love (John 13:35). A person’s capacity to enter into a warm, loving relationship with God or with others is developed first, for better or for worse, in the family in which he grows up. If a child experiences love and acceptance in the family, following Jesus may be a natural outgrowth of being raised in a Christian family. On the other hand, if a child is harshly treated or neglected, establishing a love relationship with Christ may be virtually impossible but for a miracle of grace. God wants to make your family a discipling center, first to disciple the little non-believers He has entrusted to your care, and second to touch the community around you. Understanding the stages of child growth and development-intellectually, emotionally, socially and spiritually-can open our eyes to opportunities for spiritual nurture which otherwise might be missed. In this way we cooperate with Jesus as He draws our children to Himself as their Savior and Friend. The Good News is: His energy is always fresh, His love constant, His persistence assured. He will, short of violating persistent, deliberate, ultimate choice, save our children! One (1): A pastor tells of a couple who enrolled three years in a row for the church’s annual parenting seminar. As they walked in for the third time, the pastor commented in jest, “What are you doing here? You already know everything I know!” Their response was profound. “Oh, they said, you’ve got it all wrong. The first year we found help for ourselves. The second year we found help for our marriage. We are finally here for the kids!” They had discovered by personal experience what Moses was talking about. Before we can nurture our children spiritually, the Good News must seep deep into our own hearts. Two (2): [The] Spirit loves to address the children and discover to them the treasures and beauties of the Word ( Child Guidance , pp. 495, 496). Angels will be your strong helpers ( Child Guidance , pp. 548). You may be evangelists in the home, ministers of grace to your children ( Child Guidance , p. 479). Three (3): A father of an eighteen-month-old boy told a parenting class of the stress he and his wife were experiencing with a fussing baby who clung to his knees and would give him and his wife no peace. He jested that, if he could find the receipt, they would take this one back! The teacher suggested that the parents take a few minutes to get down on hands and knees and observe the world from their baby’s perspective. At the next class the father reported, “It was amazing. There’s nothing down there but bare walls and legs, and Tommy’s too young to be interested in those!” The parents decided to decorate the walls in their family room especially for Tommy. To a height of about eighteen inches from the floor, they hung all manner of interesting things of every imaginable color and texture to be fingered, rattled, pulled, tasted, etc. The father later reported that they had scarcely heard from the child all week. Obviously much of this particular child’s restlessness was rooted in the need for a more stimulating environment. “I’m spreading fertilizer,” the man answered. “What are you doing that for?” they retorted. The man loved children and wanted to answer their questions, but wondered how to explain fertilizer to a child. “Well, I’m giving the grass something to eat,” he finally ventured. But the girls’ curiosity was not easily put to rest. They pondered this for awhile. Then, assured that the man would not belittle them for asking, more questions came. “How do you know it likes that stuff? How can you tell when it’s full?” And on and on. Such is the nature of how children learn. Six (6): A Sabbath School Cradle Roll teacher was explaining heaven to her class. She was talking about heaven being a fun place because you can enjoy being with Jesus and your family and others that love you. But she took great care to explain that mommies and daddies will be there-if they choose to be. It was a subtle point largely lost on the children at that age, but her careful explanation will provide a basis upon which other teachers can later build without having to first tear down part of her construction. Seven (7): A preschooler’s mother resisted the desire to simply lay out the clothing she wanted her daughter to wear in the morning. Instead, she allowed her to make a guided choice. Together they talked about what day it was (a weekday, not Sabbath), what the weather was like (hot, not cold), and what she would be doing that day (playing outside with friends). The mother then sent her to her closet to select an outfit. When she returned with her favorite Sabbath dress, they discussed why that was not the best choice and the little girl was sent back to choose again. This time she came with a play dress and a sweater. The mother affirmed the appropriateness of her daughter’s choices, but pointed out that the little girl might get too hot with a sweater on. She agreed, however, that the little girl could wear it until she wanted to take it off. Thus the mother helped her child learn the process of making a good choice, while expressing confidence in her daughter’s ability to make good choices for herself. Balswick, J. O., and Balswick, J. K. (1991). The family: a Christian perspective on the contemporary home . Grand Rapids, MI: Baker Book House. Benson, P. L., and Donahue, M. J. (1990). 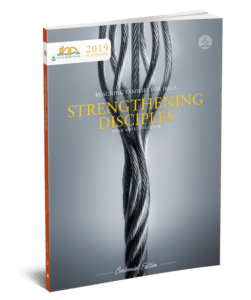 Valuegenesis: Report 1 – A study of the influence of family, church and school on the faith, values and commitment of Adventist youth . Minneapolis, MN: Search Institute. Clark, R. E. (1975). Childhood education in the church . Chicago: Moody Press. Dudley, R. (1986). Passing on the torch . Hagerstown, MD: Review and Herald Publishing Association. Elkind, D. (1981). The hurried child: Growing up too fast too soon . Reading, MA: Addison-Wesley Publishing Co.
Erikson, E. (1963). Childhood and society . New York: Norton. Flowers, K. & R, with Sahlin, M. (1992). Passing the torch . Lincoln, NE: AdventSource. Fulghum, R. (1991). Uh-oh . New York: Ballentine Books. Habenicht, D. J., and Murdoch, R. R. (1991). A Christian perspective on the psychology of character development . Berrien Springs, MI: Department of Educational and Counseling Psychology, School of Education, Andrews University. Joy, D. M. (1988). Parents, kids and sexual integrity . Waco, TX: Word Books. Nicholi, II, A. (1979). The Fractured Family: Following It Into the Future. Christianity Today , May 25. Swindoll, C. (1990). What Does It Mean to Train Up a Child? Family Life Today , October. White, E. G. (1903). Education . Boise, ID: Pacific Press Publishing Association. White, E. G. (1942). The ministry of healing . Boise, ID: Pacific Press Publishing Association. White, E. G. (1948). Testimonies for the Church. Vol. 5 . Boise, ID: Pacific Press Publishing Association. White, E. G. (1954). Child guidance . Hagerstown, MD: Review and Herald Publishing Association.